This article first appeared on EnergyPost. Utilities in Western Europe are closing down fossil fuel power plants on a massive scale. Enel announced in 2014 that 23 coal and gas power stations in Italy with a capacity of 13 GW are to be scrapped within five years. In Germany, Vattenfall sold its 8 GW of loss-making lignite-fired power plants to Czech company EPH in 2016. In 2014 E.ON announced it would close 13 GW of coal and gas capacity across Europe and both RWE and E.ON have had to undergo restructuring in recent years as a result of their gas and coal plants losing value. In the UK coal fired power is dying a slow death. The main drivers for this coal phase-out have been an increase in renewable energy coupled with very low electricity prices in most parts of Europe, and to a smaller extent, having to pay for CO2 allowances under the EU Emissions Trading Scheme. Now the Western Balkans countries – Bosnia-Herzegovina, Kosovo, Macedonia, Montenegro, and Serbia – look to be in grave danger of repeating the same mistake. They are planning to build new power plants that may suffer the same fate. A table from the briefing showing projects in advanced stage that have great political support (left-hand column) and those at a much earlier stage (right-hand column). EU market rules also apply to the Western Balkans electricity sector via the Energy Community Treaty, which entered force in 2006. It aims to extend the EU energy market to neighbouring countries and to make sure they apply EU regulations on subsidies and at least some of its environmental standards. The EU Emissions Trading Scheme (ETS) has not yet been adopted by the Energy Community, but Accession Countries – and that includes most Western Balkans countries – need to apply it as soon as they enter the EU. However none of this seems to have entered the heads of decision-makers in the Western Balkans, who remain wedded to producing as much electricity as possible, irrespective of the economic feasibility or impacts on the environment and climate. 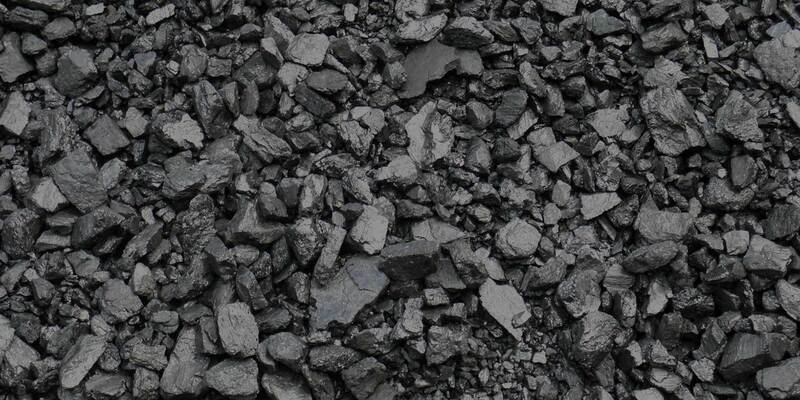 All countries in the region except Albania are planning to construct new coal power plants using low grade brown coal also known as lignite. The planners assume that coal will be cheap, but not only is coal polluting, it is also going to get much more expensive. Environmental standards are gradually improving, which means additional costs due to pollution control equipment. And once the Emissions Trading Scheme is applied, it also means significant additional operating costs in the form of emissions allowances. In a briefing published on 29 March we’ve crunched the numbers for ten new lignite power plants across the Western Balkans – one already built and nine planned – to see how much CO2 prices might add to annual operating costs. For Pljevlja II in Montenegro, one of the smallest plants planned in the region, even with a very low CO2 price of €5 per tonne, payments would amount to nearly €8 million every year. With a CO2 price at €35 per tonne – which could easily be reached by 2030 – annual payments would come to no less than €55.6 million. For the largest planned plant, the 600 MW Ugljevik III in Republika Srpska, annual payments would range between nearly €21 million and €146 million per year, for the same range of CO2 prices. 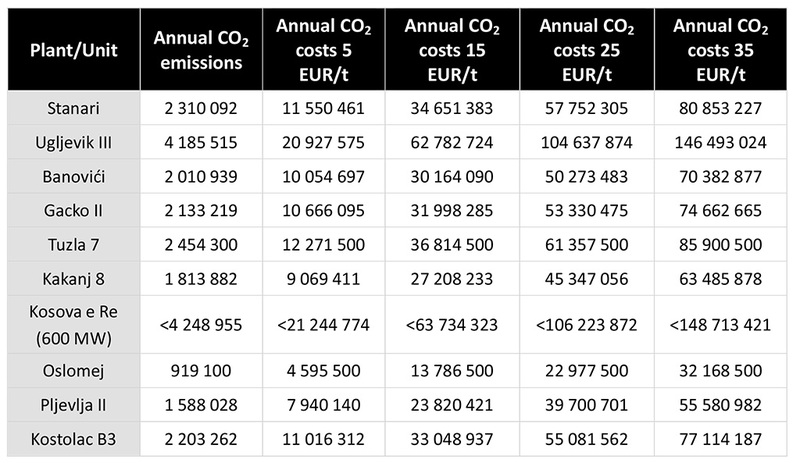 Carbon costs planned for the planned coal power plants at different prices for carbon emissions. Worryingly, these huge costs do not appear to have been properly accounted for when planning the new coal plants. In most cases no information is available to the public on the feasibility of the projects, even though most of the companies involved are state-owned. In those few cases where we do have some information on feasibility (Pljevlja II in Montenegro, Kostolac B3 in Serbia, Gacko II in Bosnia and Herzegovina), CO2 prices have not been properly taken into account. In the case of Kostolac B3 in Serbia, the feasibility study summary states that CO2 prices have not been included because it is assumed that the state will pay these. But this assumption is certainly not in line with EU or Energy Community state aid rules. What’s more, in the sensitivity analysis where a CO2 price is included, it becomes obvious that even a low CO2 price is enough to render the plant uneconomic. These findings should worry the companies developing projects, but also the governments and the public. Failure to include CO2 prices in feasibility calculations dramatically increases the risks of building coal plants that will be too expensive to operate, like many of those in Italy and Germany, and in the case of state-owned companies, it will likely be public budgets that will end up footing the bill one way or another. Most of the new coal plants planned were initially conceived 10-15 years ago when the situation was quite different. These projects have failed to take account of the massive changes that have taken place in the electricity sector since then. The companies pushing these projects urgently need to revise their feasibility assessments to take into account CO2 payments and technology improvements such as the Best Available Techniques reference document for large combustion plants which is currently under revision. If they do so, it is highly unlikely that any of the plants will turn out to be feasible. The region’s governments also need to change their way of thinking away from generating ever-greater amounts of electricity in centralised facilities, and instead concentrate on managing demand. Demand-side energy efficiency is the best way to avoid shocks from fluctuating prices of either carbon credits or imported fuels and provides direct benefits for the public such as warmer houses and a significant number of jobs. Some new capacity is still needed though. With a dearth of wind and solar power in the region, the governments also need to set 2030 targets for renewables and to diversify away from over-reliance on hydropower and coal. Without this, the region looks set to find itself stuck with a fleet of new but un-useable coal plants – a monument to the utilities’ and governments’ failure to change with the times.